LATEST: Senate EHEA Committee will hear HB1110 Wednesday, April 4 at 1pm. Deepest thanks to the Chairwoman. UPDATE: Senate Rules Committee has referred HB1110 to the Education Health And Environmental Affairs Committee. Thank you to all of the state's Delegates for your leadership. With your unanimous vote for HB1110 - requiring the creation of safety and health best practices for the schools' digital devices - you have taken a vital stand in the protection of our children's health. And thank you to all the medical experts, advocates and parent groups who are voicing overwhelming support for HB1110. The legislation soared unanimously through four separate House of Delegates votes in just two weeks. As of this writing, the bill is in the Senate Rules Committee. If Rules assigns HB1110 for consideration, that referral will first be read on the floor of the Senate, which convenes this evening at 8:00 pm. So it will be a long day - perhaps several days - of waiting for classroom screen safety advocates. Let's hope that the Maryland Senate acts quickly and follows the lead of the House of Delegates to vote unanimously in favor of establishing safety and health best practices for digital devices in Maryland classrooms. This legislation will protect Maryland students from serious, avoidable health risks posed by their schools' requirement to use digital devices. Myopia, obesity and anxiety -- all of which are associated with daily use of digital devices - are now epidemic among children. These issues are contributing to additional health risks such as diabetes and heart disease, according to medical researchers. Unbelievably, addiction and suicide are now soaring among our children; both are associated with the use of digital devices. The CDC now reports that suicides have doubled among teenage girls. Students are also put at risk for dry eye disease when they are required to use devices every day without any health and safety oversight. Children are not blinking when they use the schools' devices, which can cause discomfort, redness and fatigue. Dry eye disease can also impair and blur students' vision and affect their corneas. One pediatric ophthalmologist reports that she knows when her school district is using devices heavily again, because of the increased number of appointment calls she gets: there is a correlation. Another physician reports that she stopped asking families how much screen time the children have because "they've already told me they're online all day at school." But these health risks do not impact our children equally: some will be put at greater risk than others, especially poor children and minorities. African-American, Latino and children of Asian descent share a genetic predisposition for myopia, according to the University of Southern California's (USC) Eye Institute, whose Multi-Ethnic Pediatric Eye Disease Study (MEPEDS) is the largest ever conducted. That study concludes that myopia has doubled among our children in the last 50 years. Doubled. Clinicians report that unchecked myopia can lead to much more serious eye impairments, including glaucoma, cataracts and retinal detachment. In other words, severe myopia can lead to blindness. The lead USC researcher says that the "likely culprit" is the daily use of digital devices and an increasing lack of sunshine. Several major newspapers have featured articles on the helpful role of sunshine in the prevention of myopia, as noted by Treehouse Eyes, a Bethesda-based pediatric myopia specialty practice that fully supports this legislation. But what about the children who do not have a safe place to play outside in the sunshine? Or those who live in a food desert, without access to the fresh fruits and vegetables that contribute to their eye health? They are the same children who also lack access to eye specialists for full eye exams, or glasses. Many of the same factors that contribute to myopia - no safe place to play outside in the sun, less access to fresh fruits and vegetables, and reduced access to expensive medical specialists for both diagnosis and treatment options -- are also contributing to obesity in poorer communities. The unregulated requirement of increased sedentary behavior, as introduced by increasing use of digital devices at school and at home for homework, will exacerbate existing threats to kids who already face disproportionate risks to their health. 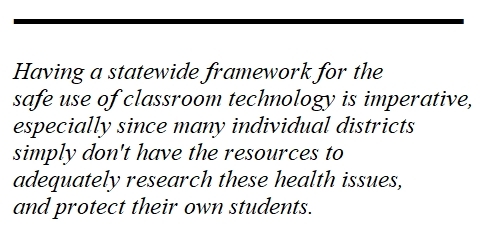 Having a statewide framework for the safe use of technology is imperative, especially since many individual districts simply don't have the resources to adequately research this, and protect their own students. All of our kids should have equal access to every learning opportunity that Maryland offers AND have equal protections from the documented health risks known to be associated with the digital device usage that accompanies some of those learning opportunities. 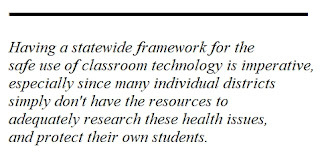 That's why the state's entire medical community enthusiastically endorses HB1110: to ensure that as the proliferation of digital devices continues, so do the health protections for all of Maryland students. Prevent Blindness has provided written testimony on this bill; so has the American Academy of Pediatrics' Maryland Chapter; the Maryland State Medical Society (MedChi); the Mental Health Association of Maryland and the Maryland Occupational Therapy Association. National support has poured in as well: Parents Across America, Campaign for a Commercial-free Childhood, and Common Sense Media have all provided testimony in favor of HB1110. Queen Anne's County supports this measure as well, and provided written testimony in favor of the bill. Baltimore County and Montgomery County parent groups, it should be noted, have been particularly vocal on this issue. Advocates for Baltimore County Schools as well as the PTA Council of Baltimore County provided written and oral testimony in favor HB1110. Indeed, representatives of these groups waited over four hours on the day of the hearing just to testify in favor of this initiative. And Montgomery County parents have recently helped to convince the Montgomery County Board of Education to reconsider its position on HB1110. 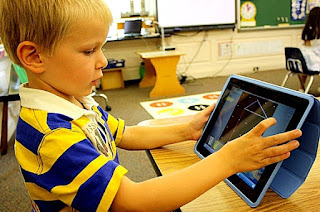 The Montgomery County BOE now fully supports this bill and will be writing a letter of testimony endorsing it, according to an article entitled "State Bill on Safe Use of Digital Devices in Classrooms Makes Progress in Legislature" published last week in Bethesda Beat. Excellent media coverage from Maryland Matters and Maryland Reporter have also helped spread the word: Maryland wants this bill. Of course our children need to master technology tools, but they must not be put in harm's way in the process, and suffer from known health risks that should have been avoided by their schools. Let's hope the legislation will be voted on in its current form without delay. There's still plenty of time in this session for our Senators to protect our children with the swift passage of HB1110.